Brow bone reduction surgery is a common forehead reshaping procedure in my practice and is done for three specific indications. Men that have very prominent ‘Neanderthal’ brow bones seek it to make their facial appearance less strong. Male to female patients have it done to create a gender appearance transition. Lastly patients that have a noticeable discrepancy in their brow size undergo the procedure for improved facial symmetry. Short of the rare indications for a shaving technique for brow bone reduction, significant changes in bringing back central brow bone projection requires an osteoblastic bone flap setback technique. This is where the bone over the frontal sinuses is removed, reshaped and put back. What has always struck me as most unusual about the procedure is that completely devascularized thin bone segments are placed over an air cavity. (frontal sinus) Why they would ever survive with no immediate blood supply and the ‘floor’ under them being a large air cavity has always been an interesting question. One would think that these thin skull bone pieces old just resorb and the brows develop a resultant depression….but they don’t. 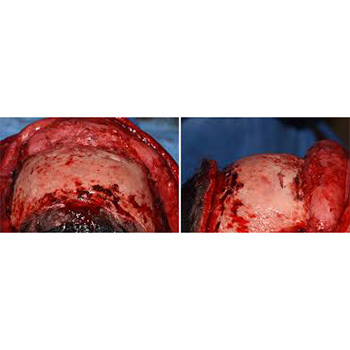 We know from extensive craniofacial surgery experience, both clinically and experimentally, that placing cranial bone as onlay grafts on the skull or face are associated with appreciable graft resorption. The theoretical contention is that the ‘biologic boundary’ has been expanded and the body pushes back to restore it, thus creating a lot of bone graft resorption. This also follows the well known biologic premise that ‘form follows function’. The bone has an established thickness which is what it functionally needs. Trying to expand it is thus only met with a restorative response. I had the opportunity to see numerous brow bone reduction sites for secondary forehead surgery. They consistently show a smooth surface although not all bone edges are fully healed with osseous tissue. Much if not all of the reshaped bone has survived although fibrous union is seen at some of the bone flap margins.